Harvest Flower has a design theme of wheat with a rustic band around the middle and a flower over that. 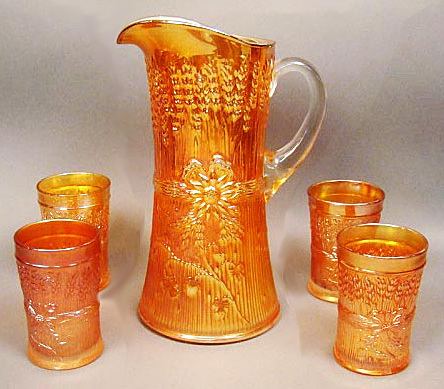 While the tumblers are difficult to find, pitchers and complete water sets are very rare. This tumbler is lime green with a marigold overlay. It sold in 1995 for $110. 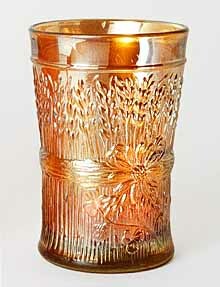 Harvest Flower has been reproduced in an iced tea sized tumbler. Updated 7/25/2018 This Harvest Flower 5-piece water set sold in 2017 for $725.